Size of this preview: 800 × 526 pixels. Other resolutions: 320 × 210 pixels | 640 × 421 pixels | 1,024 × 673 pixels | 1,280 × 842 pixels | 2,778 × 1,827 pixels. 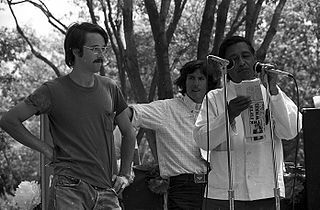 Duncan West speaking with Cesar Chavez — at the Delano UFW rally in Delano, California (1974). Duncan represented the Teamsters who were supporiting the United Farm Workers−UFW, and condeming their IBT union leadership for working as thugs against a fellow union. Duncan and his wife Mary were the branch organizers of the LA IS. Source Provided by photographer via email. Wikimedia has received an e-mail confirming that the copyright holder has approved publication under the terms mentioned on this page. This correspondence has been reviewed by an OTRS member and stored in our permission archive. The correspondence is available to trusted volunteers as ticket #2009031710063692.